Sometimes only the precise carbine hook will do – and that’s where we at RSD will deliver. Whatever size the job is, when you require a fantastically versatile carbine hook with eye then Rope Services Direct is the place for you. Sometimes called a “Carabiner hook”, this metal carbine hook has an eye at the end to stop the rope from moving freely. Reliable and durable, they’re ideal for mechanical jobs where safe practices are key. Furthermore, they’re fantastic for slightly less obvious applications, such as hanging artwork and signage. They come in a truly vast range of sizes depending on the load they are expected to bear, so whichever size you need we’re sure we can help. 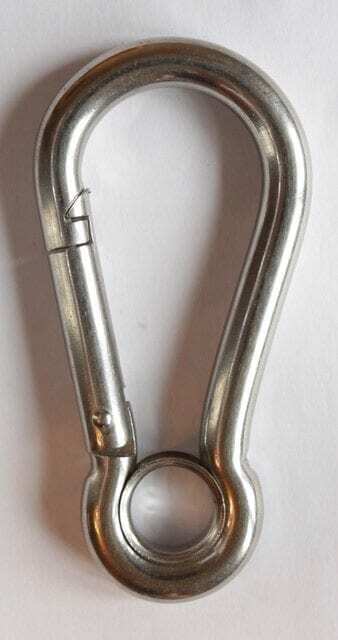 Carabiners supplied by us are made using top quality stainless steel, fantastic for use in all weathers. Not just meaning they’re strong and corrosion-proof, they give a broad range of uses in leisure activities like water sports, rock climbing and abseiling. They’re great when used with our nylon ropes too, and are durable enough to last for years to come. Whether you wish to attach it to a winch rope or one of our yacht ropes, you’re just about guaranteed to find an exact carabiner hook you want at Rope Services Direct. To pass us your order, simply fill out our e-form here. Need more advice? Just drop our knowledgeable staff a call on 01384 78004. Carbine Hook with Eye Overall rating: 5 out of 5 based on 6 reviews.